Retention has long played second fiddle to user acquisition. It's easy to see why: getting new users is fun and can feel impressive (5,000 new users, wow!). Once a user activates, acquisition's job is done. Retention, on the other hand, is never-ending, hard work. You have to ensure users' needs are satisfied over and over again, and that they continue to find value after the adrenaline rush of the first purchase has worn off. But with all the think pieces from VCs and CEOs lately, it feels like retention is finally getting the recognition it deserves. Brian Balfour, VP of Growth at Hubspot, argues that retention is the foundation of growth because it affects pretty much every metric that matters to your business. Strong retention increases your chance of virality, since users who stick around for a long time are more likely to share your product with others. The more often users return to your product, the more opportunities you'll have for monetizing them, thus increasing their lifetime value. And as you increase customer lifetime value, you can start to pipe that money into acquisition to create more opportunities at the top of the funnel. Bottom line: if you want to grow (and who doesn't these days? ), retention is the metric to focus on. So where do you start? Since you can improve so many different aspects of your product by inspecting them through the lens of retention, we recommend starting with one of the jumping off points below. Pick whichever you think might provide the highest leverage for your business. These opportunities will inspire tons of questions and analyses that go beyond “What is our retention rate?” and dig into “Why is our retention like that?” Write them down, pick one to pursue, and see where it takes you. 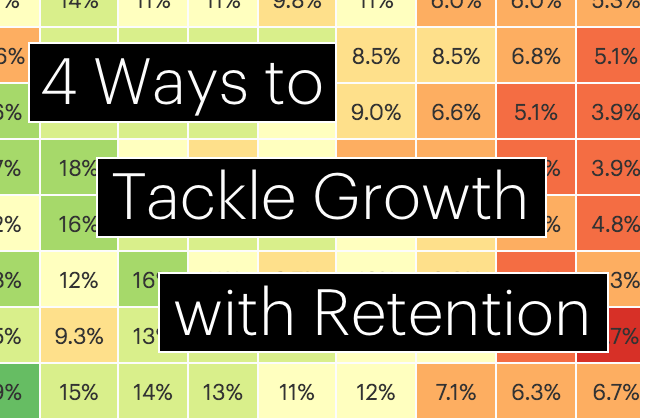 Bonus: Explore user retention in new ways and find actionable steps to accelerate growth. Download The Essential Guide to Improving User Retention. Cohort analysis has become synonymous with retention. Usually we group users into cohorts by the week or month they sign up, but you can also create cohorts based on user demographics, like device type, language, or signup source. This allows you to see if certain attributes correlate with higher retention, which you can use to guide your acquisition efforts. Who are our best users? What do they have in common? Do a higher percentage of Twitter or LinkedIn sign ups become long-term users? Are men or women more likely to become loyal users? To ensure the users you've acquired stick around for a long time, you need to help them realize the core value of your product as soon as possible. To do this, you can divide users into cohorts by what features they interact with and see what actions long-term users take. Then you can push users to take these actions, thereby—hopefully—exposing them to the value of your product. This is often referred to as an “aha moment.” One famous example is that new Facebook users become regular users if they add 7 friends in 10 days. Users who don't do this are less likely to return. What features make our product sticky? Are there any features that alienate users? Why do people who take certain actions (like sending messages or placing at least two orders) retain at a higher rate? Engagement campaigns are key to fighting churn—but you don't want to bother happy users. When thinking about when to reach out to users who might be slipping away, it’s important to know when they’re actually about to leave. If a user who’s made four purchases on your site hasn’t made one in 25 days, is she lost? Or will she likely show up again? When's the best time to reach out to a user whose usage has dropped? Are we losing this user, or is she just on vacation? Is there a pattern to when users start to slip away? Tracking retention over time will let you know if you efforts are resonating with users. High retention can be a good indicator of gaining traction and moving toward product-market fit. We built features users requested, are they more engaged now? Do new users retain at higher rates now that these features exist for them on day one? Did our retention dip because of the latest product update or some other factor? There are myriad ways that retention can improve your business. We'll be exploring retention again in a few weeks, so stay tuned! In the meantime, get out there and start exploring how retention analysis can spur growth in your product. Ready to dig deeper? Grab your free copy of The Essential Guide to Improving User Retention.